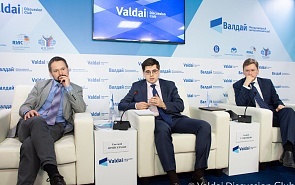 On December 13, the Valdai Club hosted an expert discussion, titled “International order and political stability in Eurasia”, together with the presentation of the report “The Old World Revisited: Future of the International Order in Eurasia” (written by Andrei Sushentsov and Nikolai Silaev) and the Valdai Paper “Infrastructure Connectivity and Political Stability in Eurasia” (written by Yauheni Preiherman). We are witnessing an unprecedented shift in the distribution of global wealth and power from West to East. The Old World, Eurasia, is regaining its lost historical leadership. At the same time, there are numerous contradictions in the region. Each of the most important regional players - China, India, Turkey, Iran and others - has its own interests, ambitions, and spheres of influence. However, even the most negative interaction aftermath of the Eurasian powers can be overcome. The key to the stability of Eurasia until 2050 is in the cooperation between all players, their participation in joint projects. Today to the fore are coming the geographic “connectivity” (free movement of goods and people), as well as “compatibility” (creation of institutional and socio-political conditions to guarantee free movement). Yauheni Preiherman, Head of the Minsk Dialogue Initiative (Belarus).